Dave Collins has raced away to win the TQ/Compact Cup from Gary Hudson and Wayne Corbett in front of a good crowd sunday night January 26 at Archerfield Speedway. 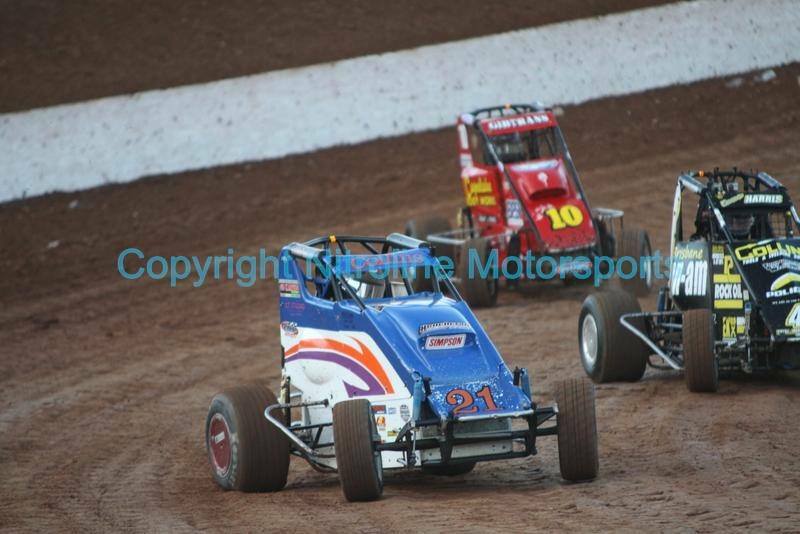 It was speedcar heaven for any purist of the sport la…st weekend as the Compacts ran in support of their bigger brothers and the latest Powri World Midget Challenge round and the racing was full on in every heat and feature!! We also welcome David Devine, Chris Seale, Steve Smith and John Churchill for the first hitout of the year. Robbie Stewart set the tone for the evening in heat 1 as he made the most of a great start and blasted off into the distance, breaking the 8 lap record in the process with a lightning time of 2.00.490 with a flying laptime of 14.756 at 97.587kph!! Barry Gibbes also ran well taking second spot ahead of Gary Hudson, Cameron Pesschier, Scott Stirling in his brand new Henchcraft, Steve Smith, Herb Hecker and David Devine having his first ever night in the class. Heat 2 saw Dave Collins get his night off to a great start with a win as he led home comfortably as Wayne Corbett and Emma Harris fought over second which Corbett ultimately claimed. Chris Paolini took 4th ahead of Dave Swan. Unfortunatley both Chris Searle and the ‘evergreen’ John Churchill were both having teething problems with their respective cars and did not finish. Corbett got the best of the start in heat 3 but it was once again ‘rocket robbie’ who took control of the race on lap 4 and took the win ahead of Corbett, Collins, Churchill, Sarah Walker and Paolini. It was a full house in turns 1 & 2 at the start of heat 4 as Stirling and Hudson went through the middle of the front markers with Gibbes running the fence making it 3 wide as they exited 2 with Stirling grabbing the lead while Hudson, Gibbes and Pesschier fought for the same piece of dirt into turn 3!! Stirling driving his new car was on a mission and was certainly on the pace as the 3 way battle for 2nd calmed down a bit with Hudson making a breakaway from Gibbes who did likewise from Pesschier who also had Emma Harris to contend with as she chimed into the contest! But it was Strirling with the win from Hudson, Gibbes, Pesschier, Harris, Swan, Hecker and Devine. Feature time and it was going to be on with the promotor reworking the track at interval, it was going to be a fast wide circuit. Collins led away at the start as back in the pack battles were raging with sometimes 5 & 6 cars diving into the corners 2 & 3 wide! Hudson was the early mover as he snaked through the traffic from grid 9 while Stirling and Stewart ran the boards. Lap 4 and the first caution flew as Stewart sat parked facing the pit gate after losing a front radius rod and consequently losing his steering….it was too early to go home yet but his night was done! At the drop of the green it was Hudson making the first move as he raced into 2nd meanwhile back in the pack it was still on for young and old and action aplenty. Corbett was the quiet achiever picking his way through as Stirling blazed the top however on lap 8 it would all go pear shaped for Stirling as they ran 3 wide into 3 with Walker in the middle of them. In a racing incident Stirling and Walker made contact with Stirlings car flipping violently several times and coming down on the top of the concrete wall. Scotty would emerge unhurt however his car wasn’t so lucky and the crew have a fair bit of work to repair the #47. At the same time Pesschier spun the #99 to avoid the incident and bicycled the car leaving Gibbes with nowhere to go and slamming sideways into him sending him over on a gentle roll and back onto his wheels! Both cars were ok and would continue. At the restart Collins led away with Hudson glued to his back pusher trying everything he could to get past even trying to bash the wall down on occasions but Collins was rock steady and held on. Corbett took third ahead of a very fast finishing Gibbes, Pesschier, Smith Harris, Paolini and Swan. DNF’s were Churchill, Stewart, Stirling and Walker. It was a great night of fast, close exciting racing and with the Aussie title getting closer the pace is only going to get quicker as crews try to find that extra edge! Next race meeting is back at Archerfield on the 15th of February so crews get workin cause the way its going… ‘you gotta be fast just to come last!